Discuss the direct tasting of life, including the unwanted guest and what it asks of us. Summarize the roles of the deep listener, the deep speaker, and the deep questioner within. Recognize the risk to be present, gifts of paradox, metaphor, and the reliable truths that never change. Apply the ordinary art of staying awake through self-inquiry, journaling, personal ritual, poetry, stories, and personal myth. Most of us can remember a time when we felt completely awake—fully present, deeply engaged, our heart and mind wide open. We also know those periods of sleepiness when our purpose is unclear, we lose our way in relationship, and life’s challenges seem more than we can bear. 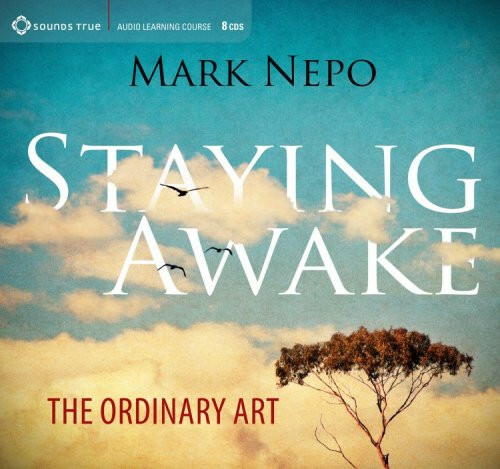 In Staying Awake, Mark Nepo invites us to inhabit our truest selves “in all ways in all directions,” as we find our own voices in the One Conversation in which each of our lives is a story waiting to be told. With a poet’s keen view of the vast and often hidden territory of the inner life, Mark Nepo talks directly about what a gift it is to be here and about the resources that the mysteries of being and experience reveal. Informed by his journey through cancer, he explores the lessons brought to us by the press of love and suffering. For each of us is born awake and yet it takes courage to stay awake, to remember that all we encounter is real. Sharing his own rich poetry along with the inspired writing of luminaries across generations, Nepo guides us in the central practice of staying awake: to be who we are, no matter what we face, and to enter our days and moments to the fullest. We do this, he teaches, by holding nothing back—by bringing all of who we are to every situation, enlivening our connection with everything life has to offer. Using teaching stories and a series of exercises and reflections, Nepo invites us to listen to our own stories and to find our own wisdom.